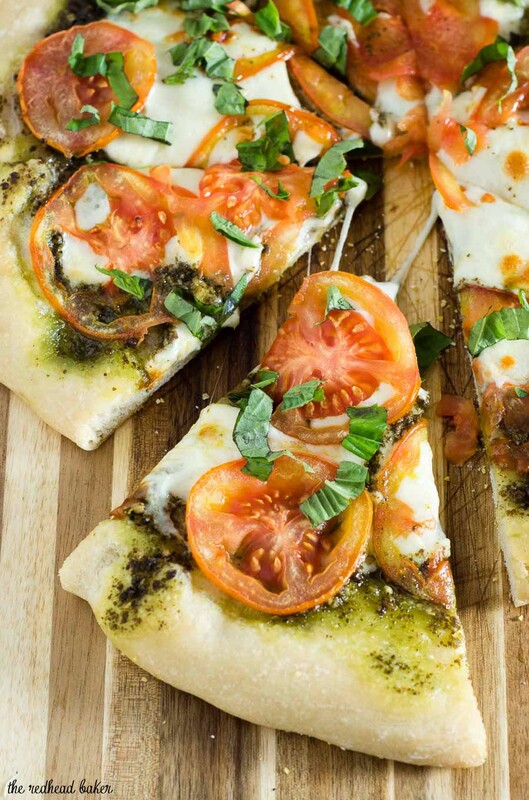 Caprese pizza is topped with pesto, thinly sliced tomatoes, and mozzarella cheese. Fresh basil and a balsamic glaze are added after baking. It’s the unofficial start of summer, and I am so excited! One of the best things about summer is fresh local tomatoes. 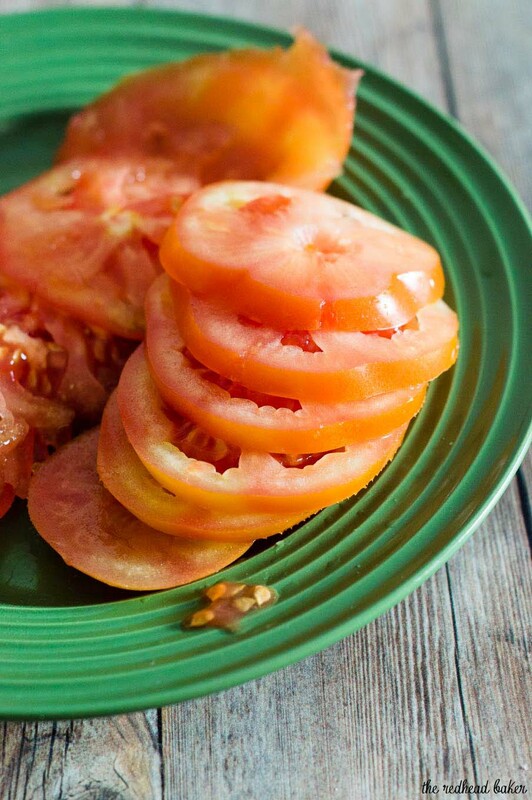 I love tomatoes, and use them as often as I can while they are in season. 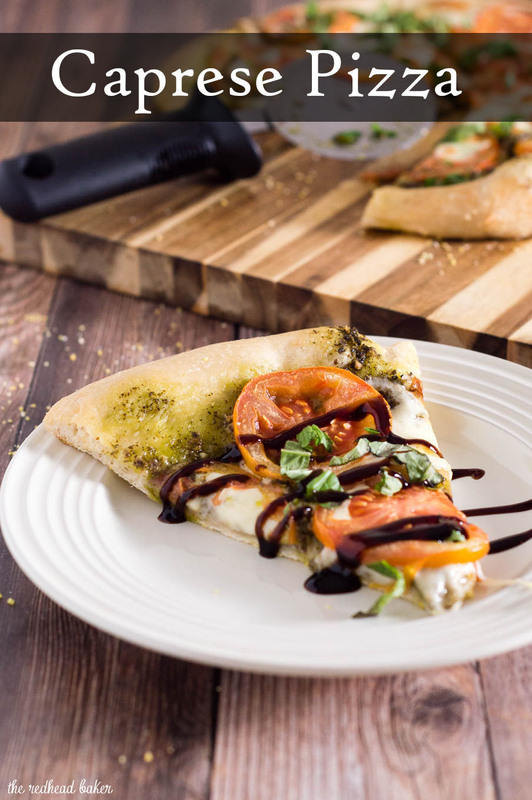 And when OXO sent me their new Chef’s Mandoline Slicer, I knew exactly what I was going to make: Caprese Pizza. I love freshly sliced tomatoes on pizza, but I can never get thin, even slices when cutting them with a knife. I’d tried another brand’s mandolin, but it was flimsy, and bent in the middle when even the slightest pressure was applied. 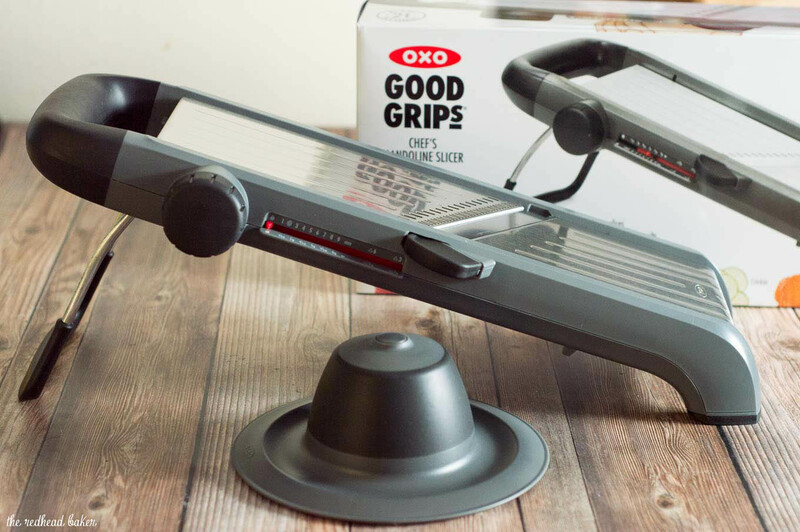 OXO’s mandolin is sturdy, has non-slip grips on the bottom, and can create 21 different cuts with thickness settings in 0.5-mm intervals, straight and wavy blades, and built-in julienne and French fry blades. You can use the mandolin to create paper-thin potato slices for homemade potato chips, julienne carrots for salad, crinkle cut squash, even cut potatoes for french fries in varying thicknesses! The mandolin cut perfectly even and uniform 1/4-inch thick slices of tomato for my caprese pizza. The spring-loaded food holder ensures that your hands stay safe from the blade, and that very little, if any, of the sliced food is wasted. I consider myself somewhat experienced with a chef’s knife, but even so, I was amazed at how much faster slicing with a mandolin is than slicing with a knife. No having to stop and reposition my fingers or the tomato. 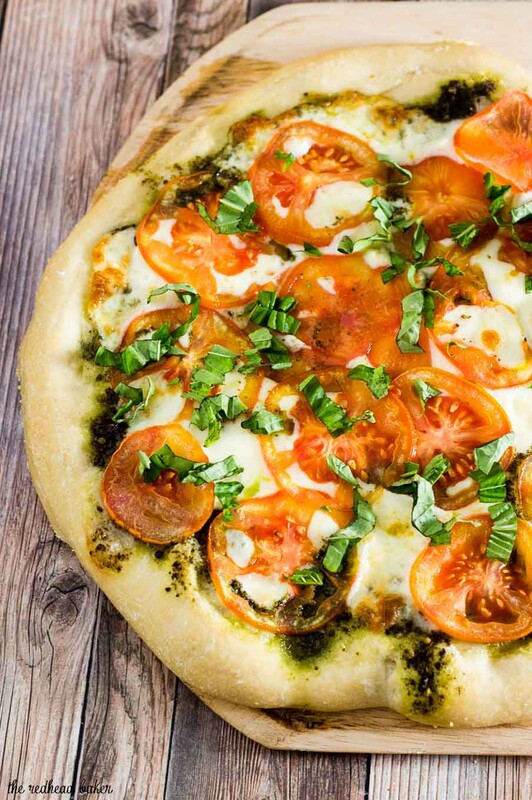 This pizza will be making many repeat appearances on our table this summer. I love the fresh flavors, and the tang of the balsamic glaze. I won’t even deny the fact that my husband and I finished off the entire pizza by ourselves in one sitting. It’s THAT good. Next time I make this pizza, I might even add a few slices of salty prosciutto, or some crispy pancetta. The glaze recipe will yield more than needed. The leftover glaze is delicious drizzled on chicken, pork, or portobello mushrooms. Mix balsamic vinegar with brown sugar in a saucepan over medium heat, stirring constantly until sugar has dissolved. Bring to a boil, reduce heat to low, and simmer until glaze is reduced by half, about 20 minutes. Glaze should coat the back of a spoon. Let cool and pour into a jar with a lid; store in refrigerator until ready to use. Can be made up to 24 hours ahead of time. Place a pizza stone in the oven and preheat to 425 degrees for at least 30 minutes. Set the mandolin to 1/4-inch thickness. 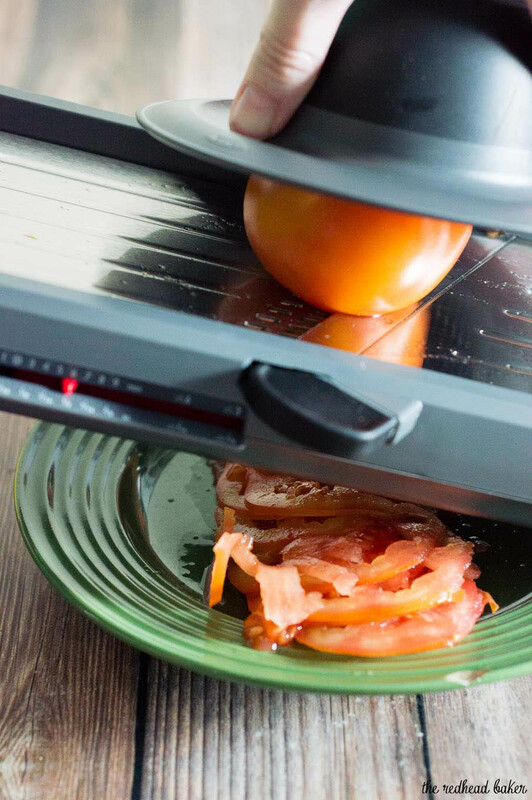 Place one of the tomatoes on top, then cover with the food holder, and run over the mandolin blade until fully sliced. Repeat with the remaining tomato. 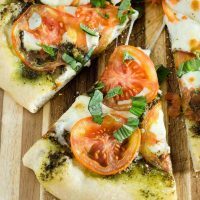 Sprinkle cornmeal or semolina flour on a pizza peel. Stretch the pizza dough out to a roughly 12-inch circle and place on the pizza peel. 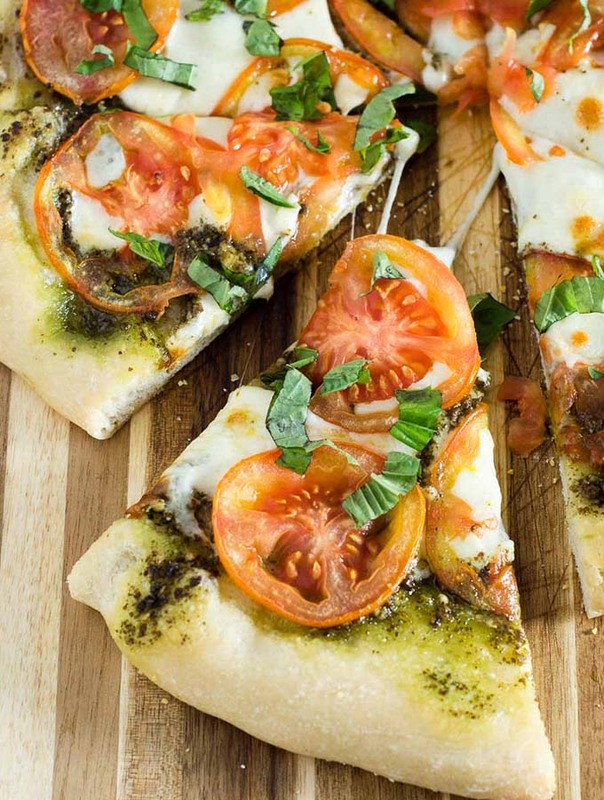 Spread the pesto over the pizza dough, then arrange the mozzarella slices, then top with the tomato slices. Use the peel to transfer the pizza onto the stone and bake for 18 to 20 minutes. Use the peel to pull the pizza out of the oven and transfer to a cutting board. Let rest for 10 minutes. Cut into 8 slices. Drizzle a small bit of the balsamic glaze onto each slice before serving. This looks incredible. Love tomato season.